Copy & Paste These 18 Done for YOU Animated Video Templates to Create Low Cost – High Converting Videos ON DEMAND! Each template comes with it’s own animated headlines, testimonials, characters, objects, backgrounds, sound effects, background music and more! 14 18 BRAND NEW "Done for You" Animated Video Templates that Give You Professional Looking & High Converting Marketing Videos in Just Minutes without the Need for Over Priced or Hard to Use Software! 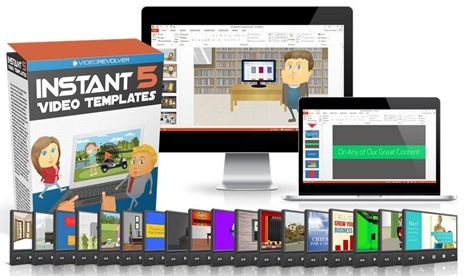 You’ll get 18 of my best animated video templates in PowerPoint, Keynote & Open Office format so you can take advantage of these templates without the need to invest in any additional software! You’ll also get the characters, objects & backgrounds from all the templates as SVG sketch files & hi-res images so you can use them in your favorite video creators like Explaindio, Easy Sketch Pro, VMFX, VideoScribe & more! You’ll also get a matching step by step tutorial videos where I show you exactly how to use them to create breathtaking videos that bring you sales or impress your clients! Instant Video Animation Templates take the guesswork out of explainer video creation. Just open up the templates, use the pre-created slides to create the slides for your video, and publish straight to a video right inside PowerPoint. Donât worry, the tutorials got you covered if you get stuck! Forget spending hours in front of the computer trying to learn some clunky and over complicated video editing software. With Instant Video Templates V5 you can easily create professional videos in minutes using the slideshow software you already know! Why over complicate things if you don’t have to?